At The Evans Clinic, we strive to provide a positive patient experience. We understand that you have choices when it comes to your Healthcare and we promise to work hard to deliver Excellence In Caring ! We offer convenient scheduling times, flexibility for same-day and walk-in appointments and a commitment to providing high-quality Healthcare services for both sick and Well visits; all delivered by professional staff in an environment of mutual respect. 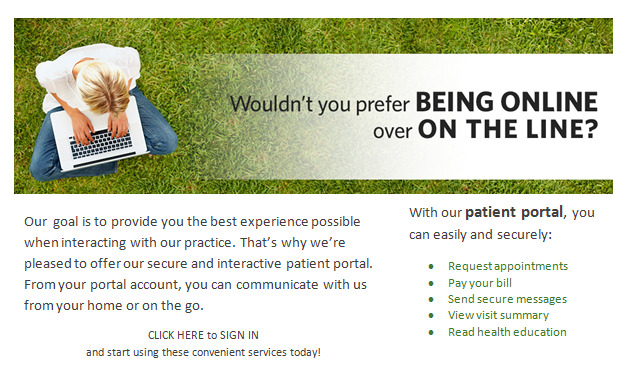 If you are a new patient, we welcome you to download our patient registration forms online. Notice of Privacy Practices PDF. Although we welcome walk-in patients, and we will do everything that we can to make sure EVERYONE is seen in a timely manner, patients with an established appointment time will have priority at the time of check-in. Please bring your driver’s license (or another form of picture identification) and your insurance card with you when you come to the clinic. When you get here, we’ll need to see both and confirm your birth date. When you get here, you may come in, register, and relax in our waiting area. We'll be with you soon! You may need your medical records released from your provider to The Evans Clinic or from us to another health provider. Use the online PDF below to expedite this process. Please download, sign and bring to the clinic the option that covers your needs. Remember, your Privacy is important to us. Release of your medical records from The Evans Clinic to another provider. Download PDF. No health insurance? Paying for the visit yourself? You will be asked to read and sign our Self-Pay Patient Policy when you get to the clinic if you don't have health insurance or want to pay for this visit yourself. Or you can print off a pdf of the form, fill it out and bring it with you: Self-Pay Patient Policy PDF.